Ultravation designs, engineers and manufactures products for every aspect of improving indoor air. You can mix and match models for solutions for your particular needs or create a matched comprehensive multi-technology IAQ system. The Orion ion generator electrically charges extremely small particles causing them to attract into clusters large enough to be captured in a quality air filter. Ultravation ProgressiveMedia filtration uses advanced UltraStrand™ electrostatically charged fibers to capture very fine particulates as small as .3 microns including some yeasts and fungi (MERV 13). More about Ultravation ProgressiveMedia whole house filtration. 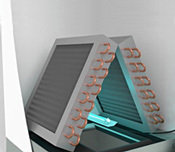 UV lights eliminate bio-growth on HVAC components optimizing HVAC efficiency. Stops the odors (like dirty sock smell) that are caused by contaminated HVAC components. More about Ultravation UV lights. Photocatalytic (PCO) air purification, unlike filtration, works at the molecular level to rid the air of bad household smells, airborne bacteria/viruses, and VOCs. More about Photocatalytic air purification. Ultravation IAQ components work great independently but together they complement each other to create a powerful whole house air improvement system. Ultravation® Orion™ ion generator for odor reduction and fine particulate reduction! The Orion™ ion generator can be used independently or in combination with other indoor air quality (IAQ) systems. The negative and positive IONS generated by the Orion™ charge even the smallest airborne particulates causing them to bind together in clusters large enough for capture in filtration. 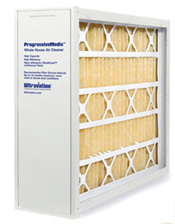 It enhances the effectiveness and efficiency of any air filter. You can also add an Orion™ ion generator as an additional stage in the breakdown of volatile organic compounds (VOCs). 3 times more powerful than others. Connects to any 24 VAC transformer or any existing Ultravation 24 volt IAQ product. Adjustable electrodes enable installation in strategic locations. Magnetic mount provided to simplify installation when possible. 6 ft. quick release power cord included.